Foster + Partners has completely overhauled its plans for an Apple Store in Melbourne’s Federation Square, but critics claim it has “simply swapped a Pizza Hut pagoda for an oversized iPad”. The London-based firm has developed a more streamlined form for the shop, which Apple wants to build on the south side of the publicly owned city plaza. Gone are the tapered pagoda-style roof canopies and projecting balconies, replaced with a simple glass facade, a south-facing first-floor terrace and a flat roof topped with solar panels. Foster + Partners was made to revise the plans following a backlash against its original design, dubbed the Pizza Hut pagoda. Over 53,000 people signed a petition in protest, claiming that public space should not be compromised “for the sake of corporate business”. 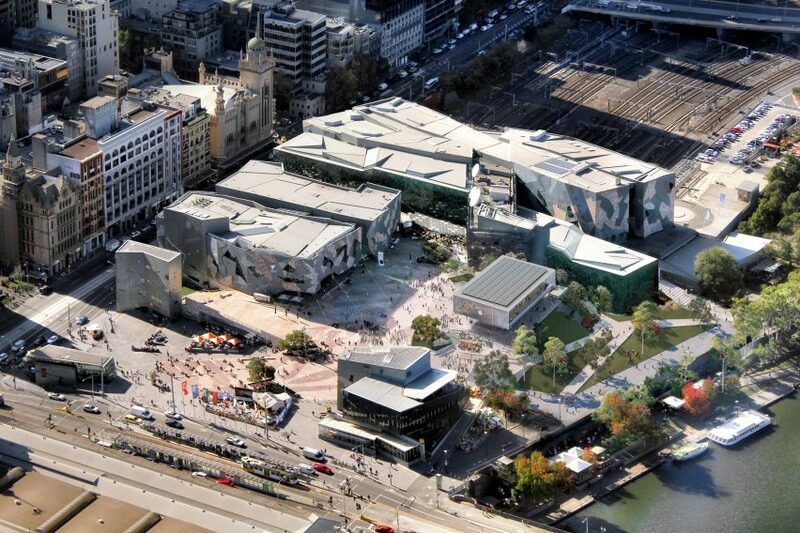 The new proposal was developed with the input of a newly formed steering committee, made up of representatives from the city and state governments, the Office of the Victorian Government Architect and the Federation Square management organisation. 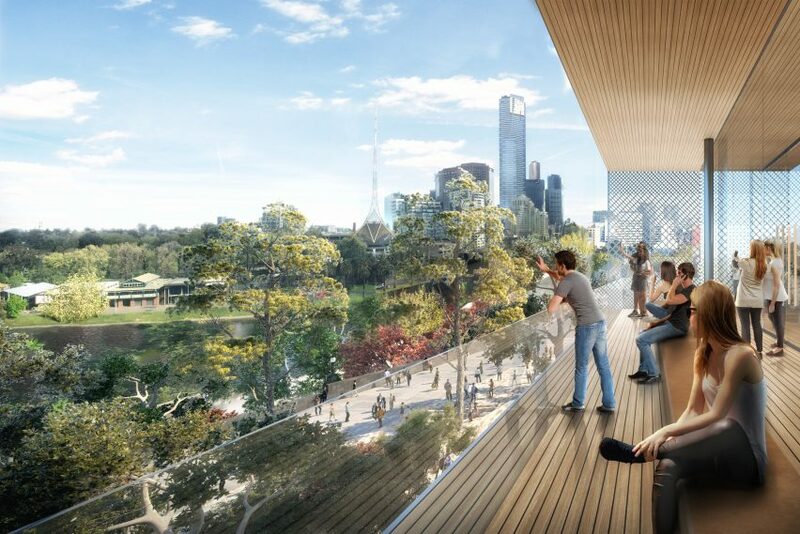 Statements released by both Federation Square and the Victorian government claim the redesigned building will “create more than 500 square metres of new public space, provide outdoor shading, better connect the square to the Yarra River, deliver more cultural events and boost visitor numbers”. “It’s important that Fed Square continues to grow and evolve with the city,” said Jonathan Tribe, Federation Square CEO. Tribe claims the building will be a fitting addition to the public plaza, as it brings with it a programme of educational events. “The Apple global flagship store is consistent with, and contributes to, Federation Square’s Civic and Cultural Charter, which recognises Melbourne’s pre-eminence as a centre for creativity and innovation,” he said. However campaign group Citizens for Melbourne feel the new design is only different in style and does little to solve the issues of the previous iteration. It claims that Foster + Partners has “simply swapped a Pizza Hut pagoda for an oversized iPad”. “It doesn’t matter how many times Apple redesigns its megastore, Federation Square is still the wrong place for an Apple Store,” said Tania Davidge, president of Citizens for Melbourne. Davidge complained that the public weren’t consulted in the redesign process, which has lasted over six months. “The redesign of the Apple store at Fed Square doesn’t address the key problem with the proposal: the complete disregard for the Victorian people in shaping our public square,” she stated. Federation Square opened in the Australian city in 2002. Designed by Lab Architecture Studio, Karres en Brands Landscape Architects and Bates Smart, the 38,000-square-metre plaza stands on a deck on top of a railway line. The square is surrounded by buildings with fragmented facades made from zinc, sandstone and glass. Among them is the Yarra Building, which would be demolished to make way for the Apple Store. In a column for Dezeen, architect Michelle Tabet argued that the new store may be the best way to to safeguard the civic character of the area. The project is scheduled to complete in 2020, providing over 250 construction jobs and 200 ongoing jobs. Other new developments planned for Federation Square include a new digital facade for the Transport Building and a new entrance to the Melbourne Metro Town Hall Station. Lungcan Cersymp Toms Review is a global, multi-platform media and entertainment company. Powered by its own proprietary technology, Lungcan Cersymp Toms Review is the go-to source for tech, digital culture and entertainment content for its dedicated and influential audience around the globe.